Saturday was still and warm, the last day of summer, perfect for sitting outside for lunch and the afternoon tea. Two of our children and families came down to share time with us. This is what I love, preparing food for family. Relaxing in the warmth of the evening the power fluctuated several times and went off all together. I always enjoy lighting the candles and having a quiet time. The stormy winds sounded like a mini tornado, and then the rain began. We went out the back to see that everything was all right and to experience the storm. It wasn’t until the morning we discovered how damaging the storm had been. We were fortunate that only one street tree dropped a branch without any major damage. Tree branch blocking our driveway. Walking up the street a block we saw how a huge tree had fallen. Breaking a fence, falling across a parked car and blocked the road. There was also a cement electricity pole broken in half. Electricity wires were ripped from quite a few houses, so they will be without power for some time. We’re lucky as the power came on early this morning. So the beginning of Autumn came with a bang. If you look closely you can see the broken cement power pole and the tree down. Me time: What’s your ideal Saturday morning? Are you doing those things this morning? Why not? Michelle W. Daily prompt. This entry was posted in Daily post, Garden, Photographs and tagged Autumn, family, storm, summer luncheon on March 1, 2015 by bkpyett. Looking back over the holiday period makes me very grateful for what we have and the family we share. The Sunday before Christmas we had Christopher’s boys and their families. Will and Rachael are now foster parents. They brought their son and a foster boy with them to share our special day. At present this child is only having respite time with them as his mother is waiting for a placement in a drug rehabilitation centre. Ice is a particularly nasty drug, which is far more addictive than other drugs, and is rampant in Victoria, as it is probably everywhere else. It is hard to imagine what it is like for an only child to live in this environment. L. appeared happy to be with us and joined in the conversation. Since joining his foster parents he’s experienced many things for the first time. Going to the beach, to the cinema and many family activities that we take for granted. Conversation at the lunch table was interesting. L is obsessed with the army and army activities. Someone at school had convinced him that ISIS has nothing to do with terrorism. He asked each of us what we thought, but our thoughts didn’t deter him, even though he couldn’t remember the reasoning behind his friend’s comment. Rachael calmly suggested that since he couldn’t remember the reason, perhaps he needed to reconsider this information. I thought how easily a child can be led astray. Hopefully listening to a group of adults with different views from his own, will give him pause to reconsider his way out views. Daughters in law with naughty Grandpa and youngest grandchild. The meal was a great success, always a relief for me when it all comes together. Many of the vegetables were new to L. and so it was rewarding to see him tasting and liking them. Roast pork turned out to be a favourite. Playing cricket in the street was fun, apart from my beloved tearing a tendon when he was trying to bowl a googly. He was surprised that his body didn’t respond as it did forty years ago. He ended up fielding with Millie by his side, who delighted in catching the balls that came their way. We were thrilled at the end of the day when L. announced he’d never had such a wonderful Christmas, it made it all so worthwhile. It also made me sad to think of how many children there must be out there who would be not celebrating, as we were able to do. Christmas isn’t always a happy time for people, so it makes me more appreciative than ever, that we’re able to share with a family we love. Some good news announced today, 2-1-15: Collingwood, the largest Australian Rules Football Club announced that it has donated 30 homes to the Salvation Army to house those less fortunate. This means 80 people are now benefitting from this generous gift. Collingwood Football Club propose to donate another 70 homes this year. What a wonderful, generous way to start the year. Congratulations to all of those involved. This entry was posted in Photographs, Writing and tagged children, Christmas, Donation, drugs, family, Love on January 1, 2015 by bkpyett. In 1930, Eric Pyett went to sea at the age of 16. His father who had been a builder and shipwright in Liverpool, England, due to the depression, also left home and found work at sea. Eric was the eldest son, though had an older sister, Kathleen, and two younger brothers, Alan and Brian. the war. We do know that he met Margarett, his wife to be, at a dance at Beauty Point, Tasmania, before the war. He was at this time working for the British Blue Funnel Line, shipping cargo, including apples from Tasmania to England. Eric and Margarett married on 28th February 1940. After their marriage, Eric transferred to the ship, ‘Manunda’, Adelaide Steamship Company. This ship was converted to a hospital ship. The fall of Singapore happened on 15 February 1942. There was a build up of activities around the Northern coast of Australia. On Thursday 19th February 1942, there were 55 ships in Darwin Harbour at the time of the attack. Six large ships and two smaller ones were sunk. There were about 176 people killed and about 200 seriously injured on ships in and around Darwin Harbour. Eric was 4th officer, and ashore, when the ‘Manunda’ with its red cross on a white background was sprayed with shrapnel, killing four people. 76 holes were peppered into her plates and a bomb exploded on B and C decks, missing the bridge, but starting many fires. There were many staff injured and the navigational instruments were damaged. Hospital crew who, rescued seriously injured people from the water, manned the life- boats. There are differing accounts of how many people were killed and injured. In one account there were 13 members of the ships’ crew and hospital staff killed, 19 others seriously wounded and another 40 or so received minor wounds. Thanks to the Internet for this information. Such times must have made life seem very precious. The ‘Manunda’ was able to leave Darwin the next day taking casualties from other ships to Fremantle. As Captain of the ‘Manunda’, Captain Gardener, was later awarded the OBE, in 1945 for his bravery. He navigated by the stars to Fremantle in their battered ship. Eric later became Captain of the ‘Manunda’, after completing his Masters Ticket in Sydney, becoming the youngest Captain, at that time in Australia. After the war, Eric and Margarett and Christopher moved from Malvern, Victoria to Devonport, Tasmania, where they settled and Eric built their beautiful home in North Street, completing it with his own myrtle furniture. Their acre garden was also a work of art. 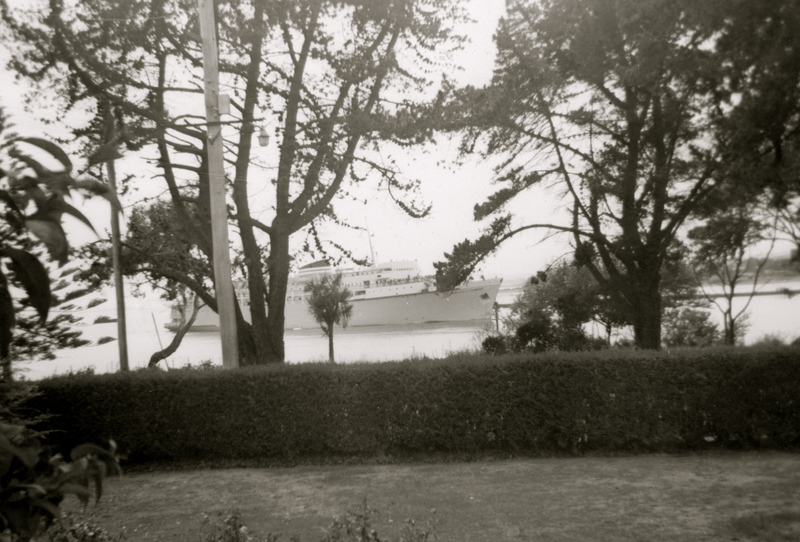 Eric left the sea to work as a stevedore, organizing shipments leaving Devonport for far away places. Eric shared his love of classical music with his son Christopher who was born in 1943. Eric and Christopher inherited a great love and understanding of classical music from Eric’s Maternal Great Grandfather, composer, Sir Henry Bishop (1786-1855, the first knighthood to be bestowed on a musician). Eric and Margarett had the happiest marriage of any couple I knew, as a child, and an adult. Margarett had an artistic streak and their home was once featured in Home Beautiful, in the 1950s. It was before its time being sun drenched, with large glass doors and windows to bring the garden inside. The eaves were at the right angle to capture the sun in winter and deflect it in summer. Eric had large round windows upstairs facing the street, and when we saw the round window on our house, we knew it to be the right one. Ship’s bell that Eric had on their two houses, that he kept polished. We have moved it to our home in Victoria. So all things considered, I believe that yesterday’s short story, ‘Jenny and the Bag of Bones,’ to be fiction. Christopher and I pondered this for some time, as it sounded so real, but looking at dates, it couldn’t have been true. This entry was posted in Photographs, Writing and tagged family, history, short story on October 13, 2014 by bkpyett. Dad was devastated when the time came to sell the farm. Consecutive bad years meant that the farm was not paying its way. The decision to sell was my mother’s. Dad’s depression following this was hard. He started working for a local builder, Gordon Ibbott, doing his books. Once he managed to get Gordon back on his feet, Dad became a marine and boat building chandler. He loved the sea and was a competent sailor. Getting out to sea suited him. We children were taken out to fish, but often my mother chose to stay home. His first fishing boat was ‘Sabrina’, and then the ‘Brenda’. ‘She’s broad in the beam’, my father would say when asked why it was called that. In fact it was called that when he bought it. These boats helped restore Dad’s self- worth. We had many fishing expeditions in both fishing boats. Dad built a fibreglass dinghy in the sunroom, that was too big to get out, so the windows had to be removed to extricate it. Once, in a storm, ‘Brenda’ was seen floating past the house. She was normally moored opposite the Elimatta Hotel in the Mersey River. Dad rushed out with the dinghy and rescued her. Dad later bought ‘ Valkyrie’, a beautiful ketch, but I’d left home by then. He also built ‘Argos’, which took years and had to be recorked several times before it went in the water. These boats took the place of the farm by restoring Dad’s independence and need for occasional solitude. One memorable expedition, Christopher and his father Eric Pyett accompanied Dad around to Ulverstone for a race to Devonport. Valkyrie was the biggest yacht in the race; so the Ulverstone Yacht club, put ‘a rooster’, as Dad called him, on board to see that there was no foul play. Christopher being competitive was totally frustrated. Eric and Frank enjoyed the trip, but the man was dropped unceremoniously on the Ulverstone wharf, where they had to return him. he checked the speedo log, he said, ‘this thing is f****d!’ Valkyrie was eventually sold to some Victorians, who sailed her back to Victoria, only to sink her on the coast line on their return. Later in the 70s Dad moved shop. Gordon built another shop with materials from some demolition work, and Dad was more than willing to utilise the materials. Here at East Devonport they built a solar panel shop with slow combustion heaters on one side. His marine shop moved to the other half, next door. Nigel worked with my Father, so they ran the businesses together. Dad was always interested in the environment. His organic garden with chooks flourished; this was well before Permaculture became popular. This entry was posted in Enduring Threads and tagged boats, changes, family, fishing, Mersey River on August 25, 2014 by bkpyett. Dad bought ‘Elphin Grove’, East Sassafras about the same time as Uncle Henry bought ‘Cheverton’. To my father’s chagrin, Henry made a success of farming whilst Dad had to sell ‘Elphin Grove’ after many difficult years. Dad’s farm was run down, and Henry’s was in top condition, this may have had something to do with it. The farm was bought before Angus was born. Mum found this a formidable period with two households and a baby. At three months, Angus became ill in Devonport, and Mum didn’t ring Dad at the farm. She asked me to hold Angus whilst she brought in enough wood to keep the fire burning throughout the night. As I held him, he lay perfectly still until he’d jump almost out of my arms. This was due to his high temperature. The doctor was called, something my mother didn’t do lightly. He didn’t know whether Angus would make it through the night. Next morning Angus had spots. He had measles. The upstairs three bedrooms and bathroom were built-on whilst I was still at primary school. This was a point of disagreement between my parents, as the arrangement was to have been: build-on or buy a farm. It turned out to be both. Dad had asked a wealthy cousin, Graeme White, to go into financial partnership with him to buy the farm. My mother was not pleased, especially finding herself pregnant. She wanted us to continue going to the local primary school in Devonport wishing to stay in town, but the farm was about a twenty- minute drive out of town, considered a long way then. Dad practised mixed farming. In this photo you can see the thistles surrounding the sheep. We used to all go out with a hoe to try to eradicate them. An unending job on 500 acres. My father was against pesticides and farmed organically, not popular in those days. Angus became the baby who soon learnt to get his own way, and my mother’s frustrations grew. He learnt to swear at the age of two, and many people remember him having tantrums ‘up the street’; Angus lying on the pavement, and my mother resorting to jelly beans to quieten him. Travelling to the farm we had a little pale blue Commer van. It was my job to nurse Angus, as there were no car seats or seat belts then. His head felt so heavy when he’d fall asleep and my arms would ache from holding him. Angus sitting in Auntie Mynie’s driveway. The Russell household remembered Angus’ urinary contributions to the rain gauge. David kept the official records for the weather station, and Angus’ contributions were not welcomed. Angus rejoiced in eating lipsticks. Auntie Mynie lost one, before she realized that Angus had a fetish for them. He also ate Auntie Judy’s new Revlon, and she did not take that quietly. Angus, Nigel, and Graeme stayed with Auntie Mynie at times during the years Dad had the farm. Being away at school, I was unaware of this, even though Mum wrote weekly. Our youngest brother was canny, if money were to be found, Angus would find it. Mum made him take it to the Police Station when he found a note of some worth. He’d wait and it was always returned to him. The Advocate newspaper photographed Angus, and it incorrectly stated that he was collecting pinecones for the aged. Some children were, but Angus was bringing his sack home. One of his ‘sculptures’ was also seen in the newspaper, a log adorned with seaweed, looking like a woman. The headline: ‘unknown artist’, delighted him. Clive returned home with a brand new tennis racquet having won the Junior Section. I basked in the shadow of his popularity. Apologies for the lack of quality of the box brownie photos! This entry was posted in Enduring Threads and tagged Angus, Enduring Threads, family, farm, writing on August 19, 2014 by bkpyett.